Edited, Introduced and Annotated by Cedric Watts, M.A., Ph.D., Emeritus Professor of English, University of Sussex. The Wordsworth Classics' Shakespeare Series presents a newly-edited sequence of William Shakespeare's works. The Textual editing takes account of recent scholarship while giving the material a careful reappraisal. 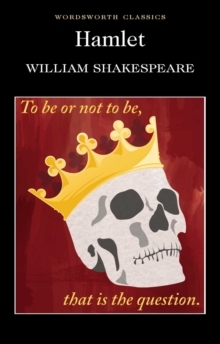 Hamlet is not only one of Shakespeare's greatest plays, but also the most fascinatingly problematical tragedy in world literature. First performed around 1600, this a gripping and exuberant drama of revenge, rich in contrasts and conflicts. Its violence alternates with introspection, its melancholy with humour, and its subtlety with spectacle. The Prince, Hamlet himself, is depicted as a complex, divided, introspective character. His reflections on death, morality and the very status of human beings make him `the first modern man'. Countless stage productions and numerous adaptations for the cinema and television have demonstrated the continuing cultural relevance of this vivid, enigmatic, profound and engrossing drama.